Regardless, if you simply MUST have everything Hello Kitty (and trust me, there are people like this in the world), then this flash drive rules. How are you NOT getting through life without this? The wristwatch is a dying device. Most people we know use a cell-phone as their time-keeping gadget, because it's handy, it's accurate, and usually has an abundance of extra features such as an alarm clock. Nobody should ever need to strap a tick-tick-tick watch to their wrist. Unless of course, you're out to make a statement. Unless of course, you're out to separate yourself from the herd, stand above the crowd, proclaim to the world that YOU ARE DIFFERENT!!!!! You are an individual and you have your own sense of style! And what could be more stylish than a kitty with no mouth? An adorable Hello Kitty watch, who'll make you smile every time you check the time. Stand out and be noticed. Nothing makes breakfast more joyful than the image of Hello Kitty burnt onto your toast. It would be like a day without Orange Juice (nobody reading this is going to get that joke!). When you bite into head, you just have to wonder... She has no mouth, so can she scream? Kitty looks better with grape jelly all over her (I just know that sentence will get me in trouble with Homeland Security). This colorful 2-slot toaster browns Kitty's sweet face onto every slice of bread. The appliance features 7 shade settings and 4 toasting modes: bagel, defrost, reheat and cancel. (What kind of toast is "cancel"?) Extra-wide slots let you warm thick slices, and a removable crumb tray makes cleanup easy. The decorative cool-touch exterior looks cheerful on your countertop, and has cord storage in the base. The perfect addition to any cute kitchen. It's hard to be a fan of anime and not have a soft spot for Hello Kitty! Author Marie Moss (who served as fashion director for Seventeen magazine) has given a voice to the popular cat icon who has no mouth. 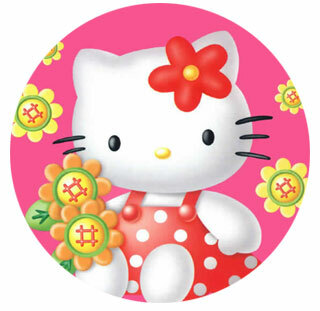 Ever since she first appeared in 1974, Hello Kitty has stolen the hearts of children, teens, and adults. This lavishly illustrated volume explores the world of Hello Kitty through the years, including her family, friends, and interests, her birthplace, sign, and favorite color. 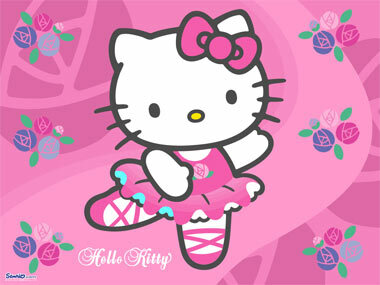 Hello Kitty started as a greeting card character but then extended into children's merchandising and fashion. The Kitty logo now appears on a wide range of licensed products. This charming Hello Kitty biography is complemented by color photos of all manner of Hello Kitty collectibles - dolls, toys, pens, jewelry, clothing, comics, backpacks, purses, even refrigerators and toasters, making this book purrrrfect for anime fans. "Her life's dream is to live in a Hello Kitty-shaped house, with two ears sticking out of the roof. But her ultimate wish -- which Sanrio hasn't marketed yet -- is to have a funeral Kitty-style with a Hello Kitty-shaped tombstone." The ultimate Hello Kitty store with everything from Hello Kitty items for your automobile to your bathroom! Below: Opening title from the Hello Kitty television show. Below: A Hello Kitty bathtub toy from the 80s .